The Toronto skyline is changing, with the city set to welcome a series of supertall skyscrapers, so we decided to take a look at the exciting new additions coming soon to our splendid skyline. A supertall skyscraper is a building that is between 300 metres and 600 metres tall. At present, there are no skyscrapers in Canada that fall into that category and, in Toronto, only the CN Tower has such an impressive height. The current tallest building in the city is First Canadian Place, which falls just outside the supertall category at 298 metres. Then name says it all: the Mirvish family is one of the most famous in Toronto, while world-renowned architect Frank Gehry is one of the city’s most famous sons. Combine the two together and you have one of the most eagerly-anticipated developments in Toronto’s history. Located in the heart of the Entertainment District that the Mirvish family did so much to create, Mirvish + Gehry will have a unique design that could only come from a mind as brilliant as Gehry’s. The development boasts two towers that will stand next to the Royal Alexandra Theatre. The original plans had just one of the towers as a supertall structure but a recent re-submission saw the heights of both towers increased. 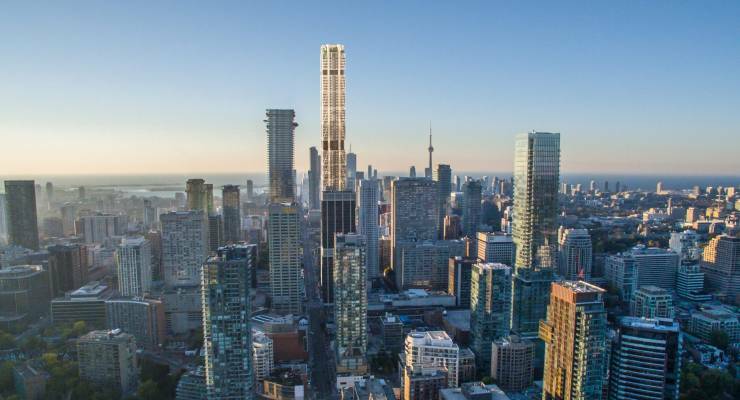 According to these updated plans, the western tower will be 329 metres tall and have 91 storeys – making it the tallest of the proposed supertall skyscrapers in Toronto. The east tower isn’t too far behind, with 81 storeys and rising to an impressive height of 301.6 metres. 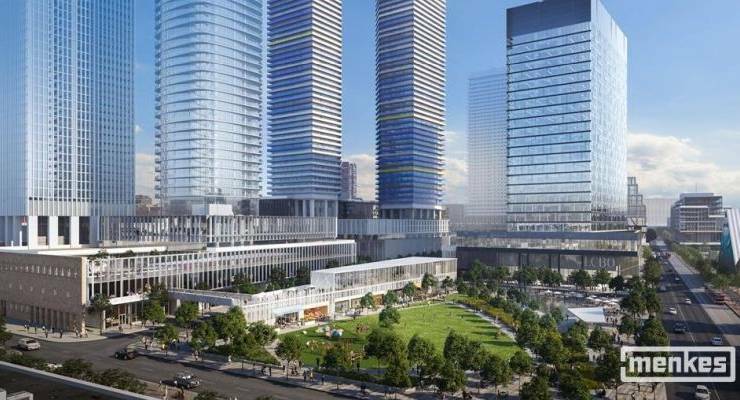 Situated on the site of the old Toronto Star building, Pinnacle One Yonge by Pinnacle International is one of the most ambitious developments in Toronto. The overall development will include six buildings, a 50,000-sq.-ft. community centre that will be operated by the City of Toronto, and direct access to the city’s PATH network. The undoubted highlight of the development is phase two: a 95-storey, 307-metre residential tower that will dominate the waterfront skyline. The elegant skyscraper will look down on all others in the waterfront area when it is finished and its prime location at the beginning of the city’s most famous street will make it a popular location for investors. Located at 1 Bloor Street West, The One will be on the corner of one of the city’s most desirable intersections: Yonge and Bloor. The luxury building will rise to over 306 metres and will be notable for its style and elegance as much as its size. In addition to the landmark address, The One also boasts some famous names, with noted architectural firm Foster and Partners responsible for some of the design. 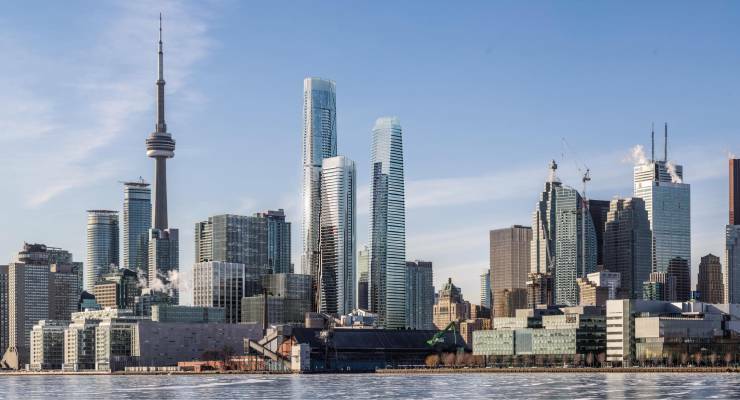 With construction already underway, developer Mizrahi Developments expects the project to be complete in early 2023, at which point it will take the crown as the tallest building in Canada. Not wanting to be miss out on the supertall fun, developer Menkes joins the list with not one, but two buildings! As part of the Sugar Wharf development on the old LCBO lands near Toronto’s waterfront, the developer will be building a new community with four residential towers, a 25-storey office tower that will be the home of the new headquarters of the LCBO, a flagship LCBO store and a large grocery store. Out of the residential buildings, towers ‘B’ and ‘C’ stand out, with both towers boasting 89 storeys and rising to 304.1 metres. There will be little standing between the two towers and Lake Ontario – offering amazing views to residents on the south side of the buildings and making them large landmarks for anyone looking at the city form the water.